Back of the Cereal Box: Kablammo! ... 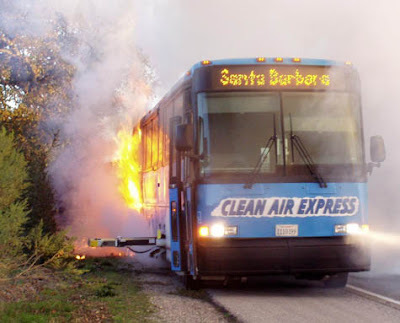 I also get to write fun headlines like "Clean Air Bus Spews Black Smoke." The irony is almost stifling. No, wait. That's the acrid smell of a burning bus. What are the odds that we would both write about modes of transportation on fire. You both wrote about modes of transportation on fire on the same day while the two of you were also on fire?